Hot Shot’s Secret, a two-year sponsor of Pacemakers Dragway Park located in nearby Mt. Vernon, OH, is pleased to continue sponsorship of Madi Lowther as she moves up to racing in the Jr. Dragster class this year. The season opens April 13 and runs through the end of October. 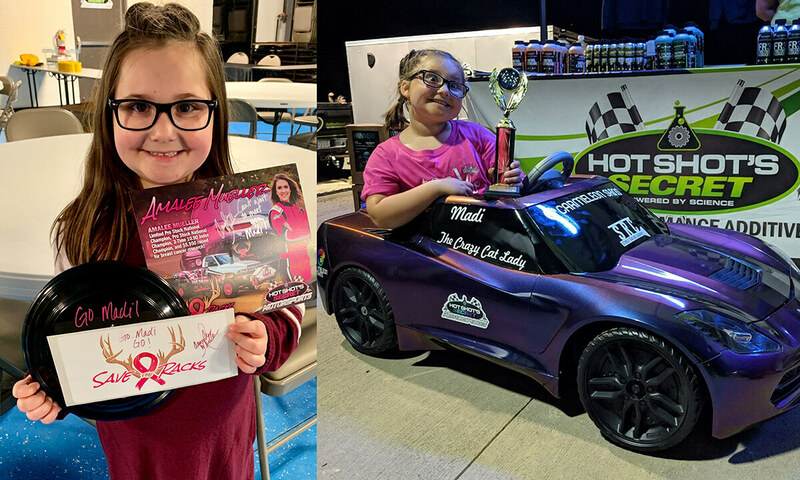 “Madi Lowther is the defending Power Wheels Drag Racing track co-champion, and is my favorite little sponsored racer in the world”, stated Kyle Fischer, Director of Sales for Hot Shot’s Secret. Her Dad, Justin Lowther, met Kyle at the annual Pacemakers Dragway banquet at Hot Shot’s Secret headquarters in Mt. Gilead, OH in February 2018. The two made an immediate connection, and Hot Shot’s Secret agreed to sponsor Madi’s racing efforts for the 2018 season, as well as provide goody bags and tee shirts for the Power Wheels competitors. “Seeing this little firecracker out on the track gives me renewed belief that our sport will continue to thrive. She’s a fierce little competitor, and I love the story about how she got her Crazy Cat Lady title. During one particular race she was dressed for Halloween as a cat lady, and during the race her costume came loose and was dragging behind her, but she never swerved or slowed down! ” said Fischer. Hot Shot’s Secret, a leading brand of performance fuel and oil additives and manufacturer of Adrenaline Racing Oil, has broadened its Adrenaline Racing product line to include Adrenaline Racing Transmission Fluids (available in Multi-Vehicle ATF and Nano Shift) and Adrenaline Racing Gear Oils (available in R9, R11 and R14). Both the new transmission oils and gear oils were developed to improve protection and performance for high load/high torque race applications. 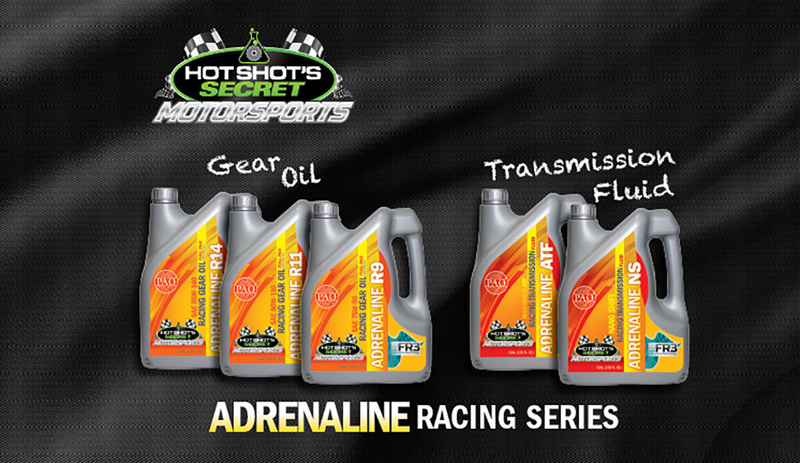 Hot Shot’s Secret Adrenaline Racing Gear Oil lowers operating temperature, reduces wear and shearing and improves oxidation stability, and is available in three viscosities: Adrenaline R9 (75W-90), Adrenaline R11 (80W – 110) and Adrenaline R14 (85W-140). Adrenaline R9, R11 and R14 Gear Oils are all based on 100% Group IV polyalphaolefins (PAO) and high quality Group V synthetic oils infused with FR3 nano technology to reduce wear and shearing. This patented formula provides a boundary layer of protection that improves film strength, improves thermal stability and reduces friction for added protection against varnish and sludge deposits; while allowing for extended drain intervals. 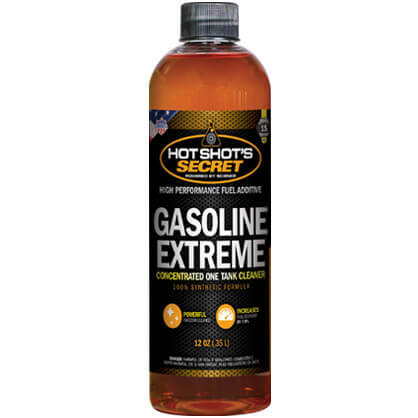 Hot Shot’s Secret Adrenaline Racing Transmission Fluids, ATF and NS, are for use in automatic transmissions coupled with high horsepower, high torque engines where heavy loads place a greater demand on transmissions. With increased oxidation resistance, improved thermal stability deposit and sludge prevention, Adrenaline ATF and NS improves horsepower up to 3% and protects against wear under extreme heat with longer drain intervals. Added thermal stability assists energy efficiency for improved shifting response. Both racing transmission fluids are 100% Group IV PAO synthetic fluids infused with Hot Shot’s Secret’s patented FR3 nano technology and a specially formulated additive package. FR3 is a friction reducer with oxidative benefits that delivers long lasting wear protection under extreme pressure. The extreme pressure additive package removes varnish and sludge for maximum wear protection of clutches, bearings and bushings under extreme pressure. Adrenaline NS is formulated for high horsepower racing applications that require Ford Type F fluid, Allison C-4 fluid or extreme horsepower levels, while the Adrenaline ATF meets the high-performance requirements of numerous applications including Dexron VI, Mercon and more. Following the successful launch of Hot Shot’s Secret’s Adrenaline Racing Motor Oils last season, Hot Shot’s Secret worked all year to formulate and test this new line of Adrenaline Racing Transmission Fluids and Gear Oils along with the help of Firepunk Diesel in the team’s record-breaking trucks during the 2018 season. 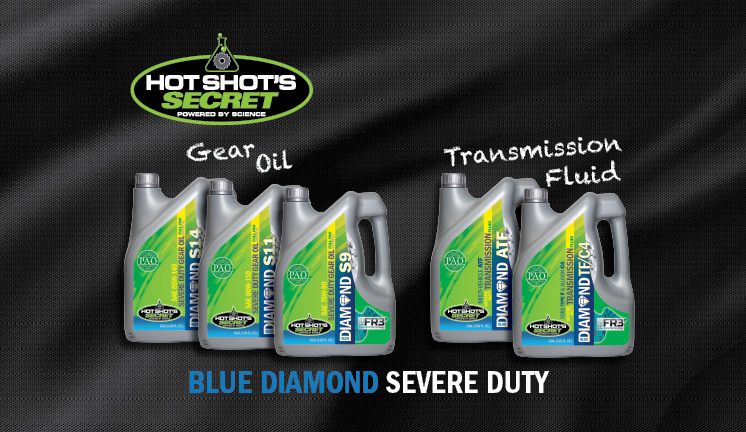 Hot Shot’s Secret, a leading brand of high performance fuel and oil additives for gas and diesel vehicles, now offers a new line of Severe Duty Transmission Fluids and Gear Oils branded under their most premium line, Blue Diamond. Blue Diamond Severe Duty formulas are for all vehicles that experience heavy loads, towing or challenging terrain including commercial or utility vehicles, semi-trucks, motorhomes, tractors and off-road vehicles where there is an excessive demand on transmissions and gears. 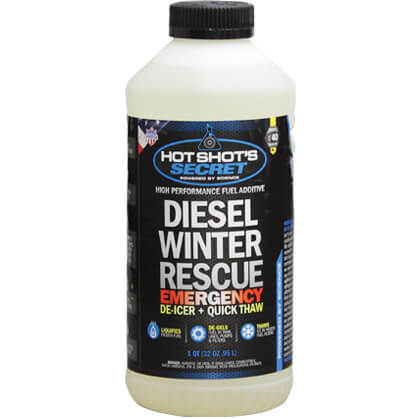 Hot Shot’s Secret, a leading brand of high performance oil and fuel additives, now offers a new winter emergency product – Diesel Winter Rescue. This formulated product reliquifies gelled fuel and de-ices frozen fuel filters to restore the flow of diesel fuel to the engine allowing the vehicle to be fully operational again. 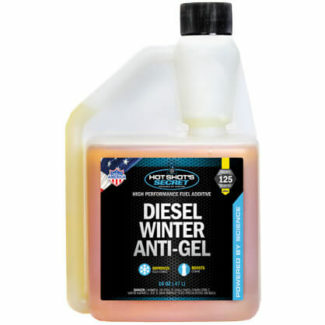 Unlike Hot Shot’s Secret’s Diesel Winter Anti-Gel that works as a preventative maintenance product in cold weather, Diesel Winter Rescue contains a military grade de-icer and works to disperse moisture throughout the fuel system: tank, lines, pumps and filters to return diesel powered vehicles to normal operation, regardless of outside weather conditions. When temperatures dip below freezing, this product is the one to have on hand for emergencies as a safety precaution. 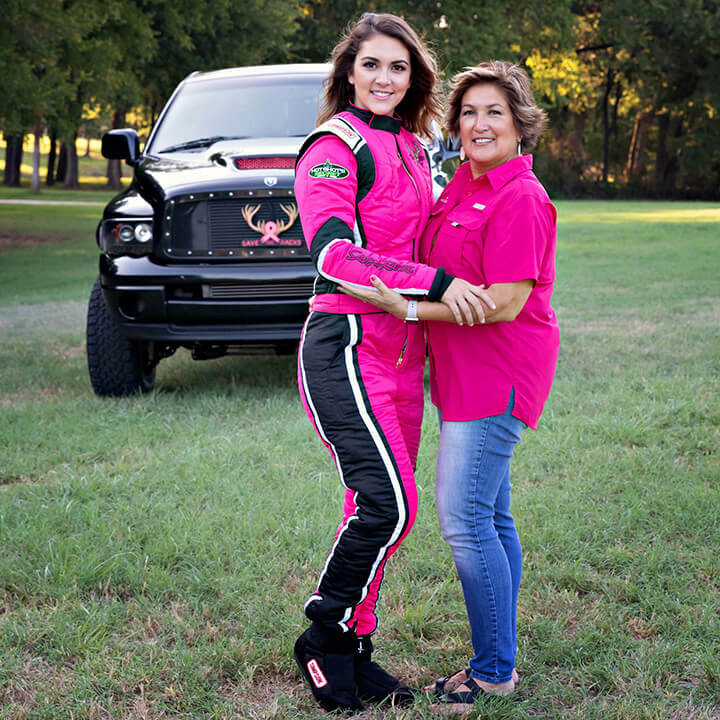 In support of breast cancer research, Lubrication Specialties Inc., manufacturer of Hot Shot’s Secret performance fuel and oil additives and ADRENALINE race oil, announce a contribution of $5,950 to the Breast Cancer Research Foundation. The funds were raised throughout the NHRDA race season through a special promotion sponsored by Hot Shot’s Secret. The promotion rewarded funds to Mueller’s Save the Racks charity for each successful pass made in either of Mueller’s two Save the Racks themed trucks driven throughout the 2018 race season by Mueller or Firepunk Diesel team member, Larson Miller. Hot Shot’s Secret donated $50 for each pass, in addition to giving a $250 bonus for each runner-up finish and a $500 bonus for a class victory at each NHRDA event. This, in addition to Save the Racks promotional tee shirt sales, accounted for the close to $6,000 in funds raised for breast cancer research. 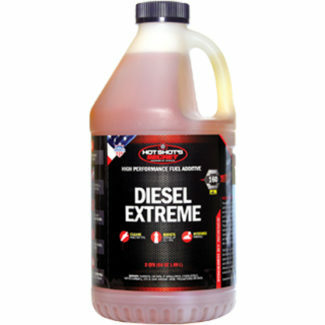 Hot Shot’s Secret is widely recognized for their full band of performance additives for diesels including Diesel Extreme – a powerful cleaner developed to improve fuel economy, combustion and ignition efficiency for any diesel powered engine. 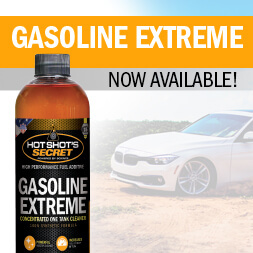 Now, Hot Shot’s Secret introduces Gasoline Extreme – a powerful new fuel system cleaner developed specifically for gas powered vehicles. Like Diesel Extreme, Gasoline Extreme is a 100% synthetic cleaner that both cleans and lubricates fuel injectors, valves, pumps, rings, pistons and upper cylinders resulting in a smoother idle, quieter operation and improved overall performance and fuel economy. With one application, this concentrated formula has been proven by third party testing to increase fuel economy up to 7.9%. Simply use one 12 oz. bottle per 15 gallons of gasoline to fully restore performance, power and fuel mileage, then maintain with the same application every 10,000 miles. Hot Shot’s Secret first entered the market with Stiction Eliminator as a way to clean and correct lubricity issues related to the Ford Powerstroke 6.0L fuel injectors. 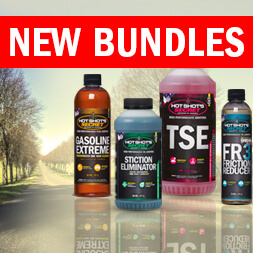 Stiction Eliminator is now one of the top selling oil additives on the market. Gasoline Extreme is a concentrated gasoline fuel additive that stabilizes ethanol and dissolves the gum and varnish that rob power from vehicles. Fully formulated with a strong detergent and lubricity additive package, it both cleans and lubricates important components of the fuel system and removes combustion chamber deposits for maximum performance and efficiency for all age, make and model gasoline powered vehicles. As title sponsor of the National Hot Rod Diesel Association (NHRDA), Hot Shot’s Secret is pleased to announce the winner of the 2018 co-sponsored NHRDA World Finals VIP Trip Giveaway. Steve and Faye Schwanger were recently the proud recipients of two VIP tickets to the NHRDA World Finals held on October 12 and 13 in Ennis, TX. The couple received as a grand prize a luxury box suite in the Texas Motorplex tower, two tickets for the year end banquet, NHRDA and Hot Shot’s Secret swag, two round-trip flights, two night’s accommodations, a rental truck, two 2019 NHRDA memberships and much more. 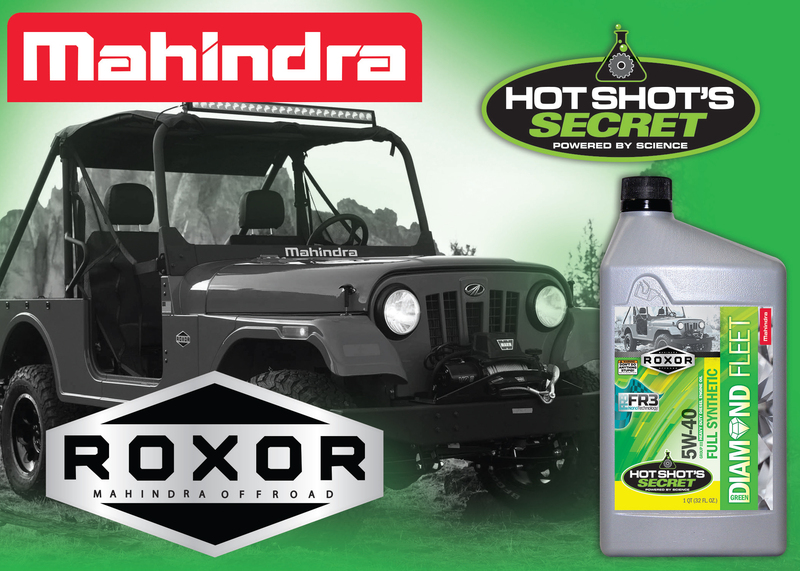 Mt Gilead, OH, (October 23, 2018)… Lubrication Specialties Inc. (LSI), manufacturer of Hot Shot’s Secret performance additives and oils, is pleased to announce that Mahindra ROXOR off-road vehicles (Classic, LE and SE) sold in North America will now include Hot Shot’s Secret Green Diamond Engine Oil synthetic diesel engine oil as part of the maintenance package available at ROXOR dealers. Hot Shot’s Secret Green Diamond 5W-40 synthetic engine oil is a 100% pure synthetic engine oil using only Group III base oils that is ideally suited for ROXOR’s 4 cylinder, turbo diesel engines. Green Diamond is infused with patented FR3 Nano-technology and a CK-4 blended detergent additive package that provides exceptional oxidation and thermal stability, and prevention of deposits and oil breakdown. The result is reduced engine wear, improved fuel economy and horsepower and reduced oil consumption and drain intervals. ROXOR chose Lubrication Specialties Inc. to supply the oil for their branded oil change kits due to the superior product, as well as the flexibility that LSI has to meet the specific needs of ROXOR. 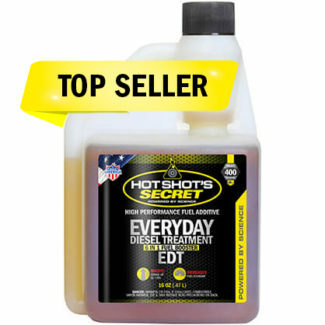 Green Diamond Engine Oil is available nationwide at independent Hot Shot’s Secret dealers and online at hotshotsecret.com. Congratulations Firepunk Diesel on a World Record! Posted on September 26, 2018 | Leave a Comment on Congratulations Firepunk Diesel on a World Record! Lubrication Specialties Inc., manufacturer of Hot Shot’s Secret and sponsor of the Firepunk Diesel race team, congratulates Lavon Miller and his entire team on their record-breaking 1/8th mile at the Hardway Performance Sunshine Showdown this weekend at the sixth stop of the Outlaw Diesel Super Series in Florida. The Firepunk Diesel/Save the Racks Chevrolet S-10 driven by Larson Miller had an epic day at the track. 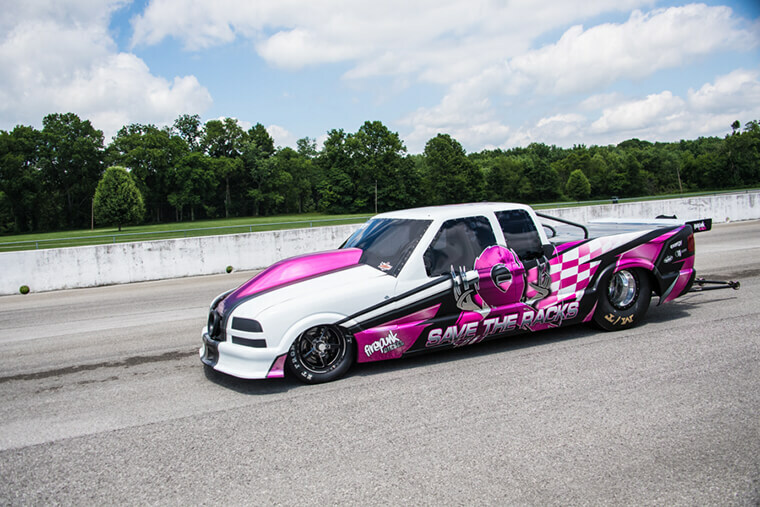 In the first round of eliminations, and even with problems keeping the truck tracking straight, Miller tied Ryan Milliken’s record of fastest diesel-powered door car in history at 4.554 and a 3.04 half-track time. After the pass, the Firepunk team began working furiously to resolve the tracking problem, which turned out to be a broken suspension component finally fixed just in time for the final round. Lubrication Specialties Inc., manufacturer of Hot Shot’s Secret Adrenaline Racing Oil and high performance fuel and oil additives, proudly announces sponsorship of the full Firepunk Diesel Race Team. 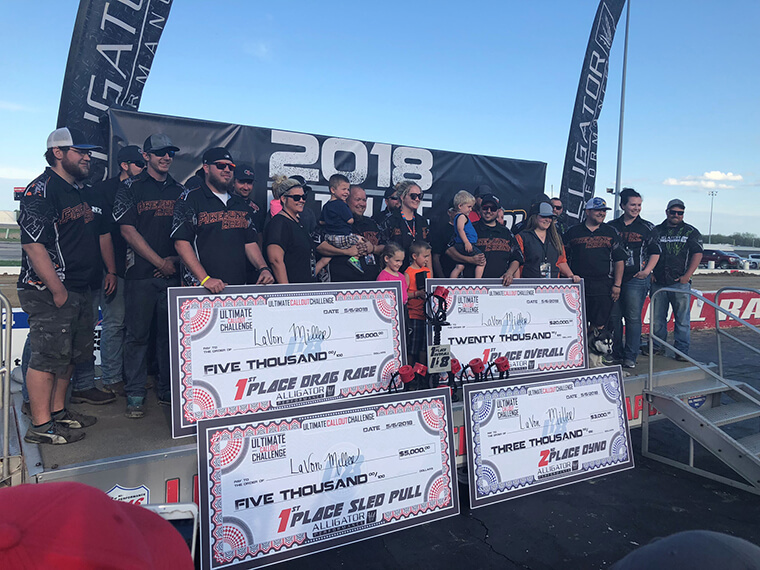 The team is one of the top race teams in diesel drag racing competition including the NHRDA Hot Shot’s Secret Diesel Drag Racing Series and the Outlaw Diesel Super Series. Prior to August, Hot Shot’s Secret sponsored Lavon Miller of Firepunk Diesel, widely known for his three consecutive wins in the Ultimate Callout Challenge. Posted on May 11, 2018 | Leave a Comment on Truck Tech Season 5, Episode 10 Premier! Tune-in to GearZ TV & Stacey David’s Season 12! Check out the new premiere of Episode 7: “Big Bad Buick” featuring: Hot Shot’s Secret Diesel Extreme, Diesel Winter Anti-Gel & Everyday Diesel Treatment. Check your local listings for channel information.